Youngstown State University has decided to allocate $5.5 million of its nonendowment assets into alternative investments. Alternative investments consist of a broad range of assets that do not fit into the traditional classifications of stocks, bonds and cash. Common types of alternative investments include hedge funds, real estate and commodities. $2 million is being invested in the Wells Fargo Absolute Return fund, $2 million is being invested in the Diamond Hill Long-Short Fund and the remaining $1.5 million is being invested in the Voya Global Real Estate Index. $4 million of the money being moved into alternatives was previously invested in short-term bonds, while the other $1.5 million was invested in long-term bonds. Neal McNally, interim vice president for finance and administration at YSU, said the $62,970,000 that the university has invested is the accumulation of prior year-ending balances. The money is used as a buffer or reserve fund for the university in case of emergency. Hartland and Co., the investment firm that handles the university’s assets, suggested the change. The investment plan they presented to the university’s Board of Trustees states that alternative investments provide an opportunity to target improved returns over bonds while assuming less risk than if the money were invested in stocks. It also states that there is low correlation between alternative investments and other asset classes, which results in better diversification. Stocks offer a projected return of 10 percent and a projected risk of 15 percent. Projected returns for bond markets range from 2.4 percent to 2.6 percent while the projected risks range from 1.9 percent to 3.2 percent. 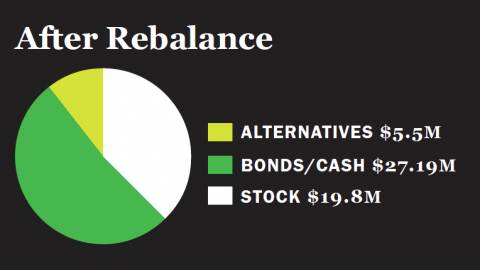 Alternative investments fall somewhere in the middle with a projected return of 4.3 percent and a projected risk of 5.5 percent. The university is currently seeing between $700,000 and $1 million in returns on investments in any given year. Alternative investments are also less liquid than other asset classes, which means they cannot be easily turned into cash in the short-term. McNally said it’s worth pursuing alternatives in an attempt to increase revenues to the university. It’s not an uncommon approach among higher-education institutions. A 2014 study conducted by the National Association of College and University Business Officers looked at 832 colleges and universities and found that on average 51 percent of a university’s assets were invested in alternative investments. McNally emphasized that YSU is taking a conservative approach, with the $5.5 million comprising 10 percent of the university’s investments. They will look at the returns over the next few years and decide whether to increase the amount allocated to alternative investments or to dial it back.